“Somehow there has to be something new, and somehow the composer has to challenge himself. But employing completely new means of expression or playing around with the concept of art are not in themselves necessary for creating meaningful art.” So says composer Lauri Kilpiö, whose new piano concerto Shades of Light traces a broad arc from tradition to the present day, acknowledging both Beethoven and the aesthetics of noise. 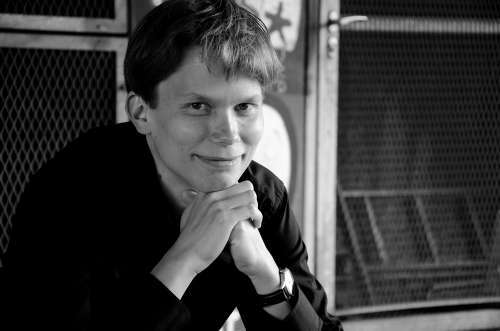 Composer Lauri Kilpiö achieves closure to an extensive work process on 3 November when his piano concerto Shades of Light is premiered by pianist Joonas Ahonen and the Tapiola Sinfonietta at the PianoEspoo festival. The first movement of the concert was completed as far ago as spring 2012, and Ahonen performed the first two movements with the Uusinta chamber orchestra at the Time of Music festival in Viitasaari in summer 2013. Kilpiö notes that the solo part was completed up to the end of the third movement at that time, but it was not until this year that he wrote the orchestra part to the third movement and the entire fourth movement, based on his original plan for the work. This is not the first time that Kilpiö has written noise music. His clavichord piece Poème de jeux acoustiques (2009) and its sibling work for guitar, Chants de joie, fureur et danger (2016), employ a variety of imaginative noise effects instead of traditional techniques. On the other hand, his orchestral work Sinfoninen kuva (Symphonic image, 2017) shows Impressionist influences, while the third movement of his piano concerto is virtuoso writing with proper notes only. Many things that have initially seemed alien and difficult to musicians and listeners alike have become more familiar and accepted over time. Does Kilpiö agree that music is constantly evolving? Approaches in contemporary music that breach boundaries and explore new dimensions are often described as ‘avant-garde’. What is Kilpiö’s take on this concept? Kilpiö describes modernism as being more familiar to him among artistic traditions than the avant-garde. He notes that modernism has had a strong presence in Finnish music, inevitably because of Paavo Heininen’s extended tenure as a composition teacher and eventually Professor at the Sibelius Academy. Kilpiö also teaches composition at the Sibelius Academy. What does working with students bring to his work as a composer? “If you demand certain qualities from your students, you must demand them of yourself too. With someone beginning their studies, I have to think about what is essential about composition technique. I actually find myself questioning my own views and habits. With advanced students, the challenge is to help them go forward, to support their personal development and, of course, to keep up with them.” Kilpiö says he learns much from his students and also gets ideas from them. On May 25 the BBC Symphony Orchestra performs an evening of Finnish orchestral music, chosen by Chief Conductor Sakari Oramo. Lauri Kilpiö's Shades of Light is one of the works performed.